A gold bar purchased in Ottawa that turned out to contain no gold did not come from the Royal Canadian Mint, the Crown corporation says. The mint's statement came on Tuesday, the day after CBC News reported that tests showed the one-ounce gold bar, purchased last month by an Ottawa jeweller from a Royal Bank branch in the Glebe, indicated it contained none of the precious metal. The bar was stamped with the Royal Canadian Mint's insignia, and the packaging it came in also bore the mint's name. But the mint said it didn't originate there. "The mint did not manufacture, ship or sell the above-mentioned product," the mint said. The mint complained the discovery and subsequent news report "has raised unfounded speculation as to the origins of the counterfeit and the purity of Royal Canadian Mint bullion products." According to the statement, the mint tests all its gold products to ensure they're 99.99 per cent pure. But despite the mint's claim that counterfeits are rare, a quick internet search shows such products abound. This is not a one-off. Nobody does this once. The real question is, how did this get into RBC's inventory. - Brian Bosse, Murenbeeld & Co.
For example, the online retailer Wish.com offers what it describes as a "Canadian Gold Bar 1 OZ .9999 Premium Gold" for a price of $13 plus shipping. The bar shown also bears the stamp of the Royal Canadian Mint. 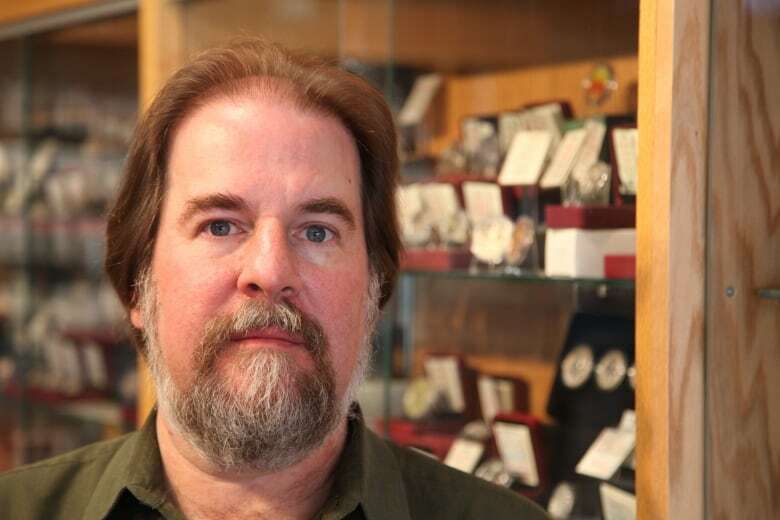 "It boils down to product knowledge," said veteran coin collector Sean Isaacs. "And the first line of defence is knowing what you're dealing with." 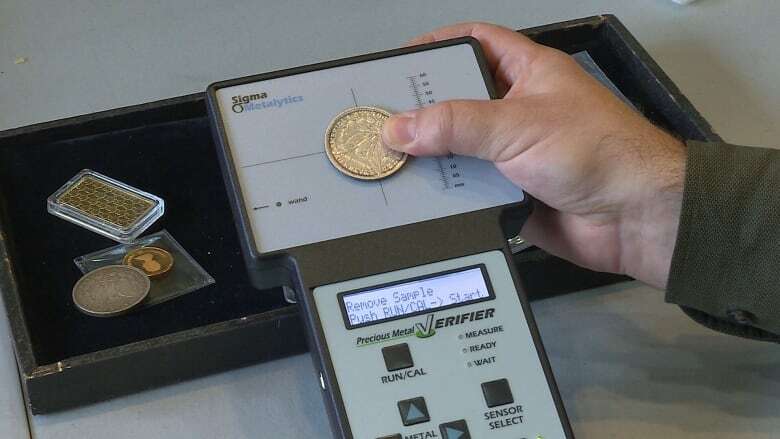 Calling it a "critical, frontline tool" for the bullion and coin dealer, Isaacs said he paid about $1,100 for his Sigma Metalytics precious metal verifier. The verifier works by analyzing the conductivity of precious metals such as silver and gold. Isaacs said a reliable verifier is something every bank dealing in precious metals should have on hand. "The average teller at a bank I don't think has the training to recognize those [counterfeit] products, which is why, in my opinion, you either need a tool to allow you to do that, or the product knowledge to know what you're handling." RBC spokesperson Anika Reza confirmed Tuesday the incident is being investigated internally, but wouldn't say if the bank is making changes to how it handles and verifies bullion. Isaacs said the fake gold bar purchased in Ottawa last month probably wasn't even made in Canada. "It's very likely produced overseas, as with the packaging," he said. "It doesn't help anyone when something like that turns up in the market, and particularly when it's sold by a financial institution." Brian Bosse, an analyst with Murenbeeld & Co., a Toronto-based forecaster of gold prices for the mining and investment sectors, has the same concern. Bosse said if it's learned that more of the counterfeit bars are in circulation, the result would be a chill on the gold market. "This is not a one-off. Nobody does this once. The real question is, how did this get into RBC's inventory?" Bosse said most buyers never question the authenticity of gold bars purchased from banks. "They know they bought it from a bank, so they're sure that it's good. But that concept is now under attack if there's more than one of these out there."